Team building refers to the activities undertaken by groups of people in order to increase their motivationEmployee MoraleEmployee morale is defined as the overall satisfaction, outlook, and feelings of well-being that an employee holds in the workplace. In other words, it referrs to how satisfied employees feel about their work environment. Employee morale is important for many businesses due to its direct effect on and boost cooperation. Many people use the phrases “team building” and “teamwork” interchangeably. However, they are two distinct concepts. While team building places emphasis on the creation of groups, teamwork emphasizes the functions of these groups. 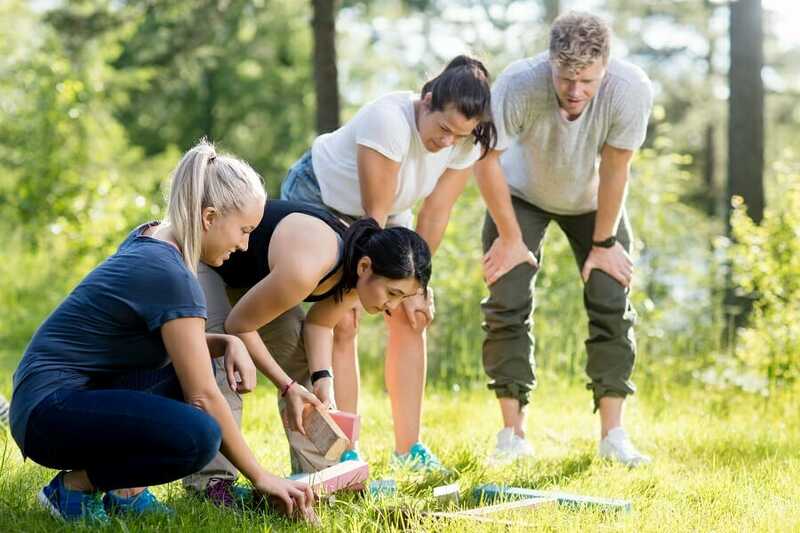 Although team building activities are meant to increase cohesiveness and cooperation, many employees don’t understand how spending a day playing games can help them bond. The truth is, how managers use team building in their organizationsCorporate StructureCorporate structure refers to the organization of different departments or business units within a company. Depending on a company’s goals and the industry which it operates in, corporate structure can differ significantly between companies. Each of the departments usually performs a specialized function helps to shape their employees’ attitudes towards the process. As such, leaders should seek to understand team building better as it will help increase their effectiveness. More specifically, leaders should be interested in learning the characteristics that make great teams and the techniques and relevance of team building. Defining the Primary Goal The main function of forming the group should be made clear right off the bat. The best way to define this purpose is by setting solid and measurable targets. This way, every team member knows exactly how his or her work contributes to accomplishing the organizational goal. Frequent Communication Another aspect that makes up an effective team entails open and free channels of communication. There should be constant communication not just among the team members but also between the team and the whole organization. This way, team members will always have the information they need to undertake their roles. Responsibility and Dedication When team members are aware of what expectations need to be met, they are more ready to be held accountable for their decisions and work. Similarly, these team members are willing to undertake proactive measures to finish the assigned tasks within a given timeframe. Overall, members of a good team are not only aware of the objectives, but they also commit themselves wholeheartedly to achieve the set goals. Laissez-faire Form of Leadership Another trait of an effective team is that it practices delegative leadership. What this means is that members are ready to take up leadership positions when situations call for it. This style of communal leadership fosters a shared responsibility, and it helps in boosting the members’ motivation and productivity. Making the goals clear is crucial to the success of any project. It means that every leader should start by providing comprehensive explanations of how each team member’s actions help in achieving the main goals. Apart from making the goals known, leaders also need to establish the specific activities that members should prioritize. This way, every member knows exactly when and where his help is required. With clear goals, it is also easier for members to see how their personal career goals align with a project’s goals. Without this clarity, many employees may focus on achieving their own goals at the expense of the team. The good thing is that if there are open channels of communicationNetworking and Building Relationships (Part 2)This article is part of a series of useful tips to help you find success in your career and the totality of your life experience. While technical skills get us hired for our preferred post, soft skills help us communicate and collaborate effectively in the workplace. Soft skills such as knowing how to get along with other people, employees can always inquire how their personal goals are related to those of the organization. When it comes to selecting team members, there are three key aspects that one ought to consider – individualism, multidimensionality, and the level of the team’s skills. It is a well-known fact that some individuals will always make better team members than others. It’s also widely known that, with determination, individuals can learn how to function as one unit. An individualist is one who likes putting his or her interests before those of his team members. Such people excel in independent roles where they’re required to work individually. However, there are also collectivists. This is an individual who likes collaboration and thrives better when he or she is part of a group. Although a collectivist makes a better team member, in some situations it is the independent tasks that help the whole group to succeed. However, a leader may have to apply more effort when dealing with individualists. Another thing that leaders need to do is to strike a balance between the experience and skills of different team members. It means distributing work evenly based on the strengths of the members. On that note, new members should also learn how to work as a fully functioning part of the team. Leaders may have to partner these new members with those who have the experience to mentor them. Team diversity is more than just a combination of skills. It also refers to how people from different cultures, genders, and races work together to achieve goals. DiversityDiversity ManagementDiversity management refers to organizational actions that aim to promote greater inclusion of employees from different backgrounds into an organization's structure through specific policies and programs. Organizations are adopting diversity management strategies as a response to the growing workforce diversity may be essential, as it enables team members to view goals from different perspectives and come up with the best way of achieving them. In a team-building setting, the purpose of and rules governing the team building activities are made clear to the members at the beginning. Tasks are then delegated to the members depending on their strengths, experience, and skills. This helps the members to work toward accomplishing the main team goals. Such a practice translates to improved work performance since employees learn to work together in achieving organizational goalsCorporate StrategyCorporate Strategy focuses on how to manage resources, risk and return across a firm, as opposed to looking at competitive advantages in business strategy. Nothing motivates an underperforming team to work harder than healthy competition. Most team building activities involve different teams competing to achieve a specific goal. Whether a team loses or emerges triumphant, the odds are that members will be driven to give their best. This not only motivates employees, but it also encourages them to apply this principle at work. Competition has been proven to improve workers’ productivity. Whenever employees are asked to work together on a task, they often communicate through email or online chat forums. While this can be efficient, face-to-face interaction often has valuable benefits. Not only does it help to reduce confusion, it also makes working together a more social experience. Team building is the process of increasing a team’s cohesiveness, productivity, and efficiency by coming up with activities that require members to work together. This process relies on a range of aspects to guarantee its success. These include factors such as good communication skills, clarity of goals, shared leadership, and a sense of accountability. In addition to the abovementioned traits, leaders need to be careful when selecting teams. More specifically, they should pick teams based on diversity and skill levels. Overall, team building helps companies achieve goals and foster healthy competition. Networking and Building Relationships (Part 1)Networking and Building Relationships (Part 1)This article is part of a series of useful tips to help you find success in networking within your company. Networking plays an important part in our professional lives, starting from our job search, contiuing to joining and working in a company, and finally, advancing our careers.